Bright and dark terrains on Titan's trailing hemisphere are revealed by Cassini's Imaging Science Subsystem in this mosaic of images taken during the T28 flyby in April 2007. 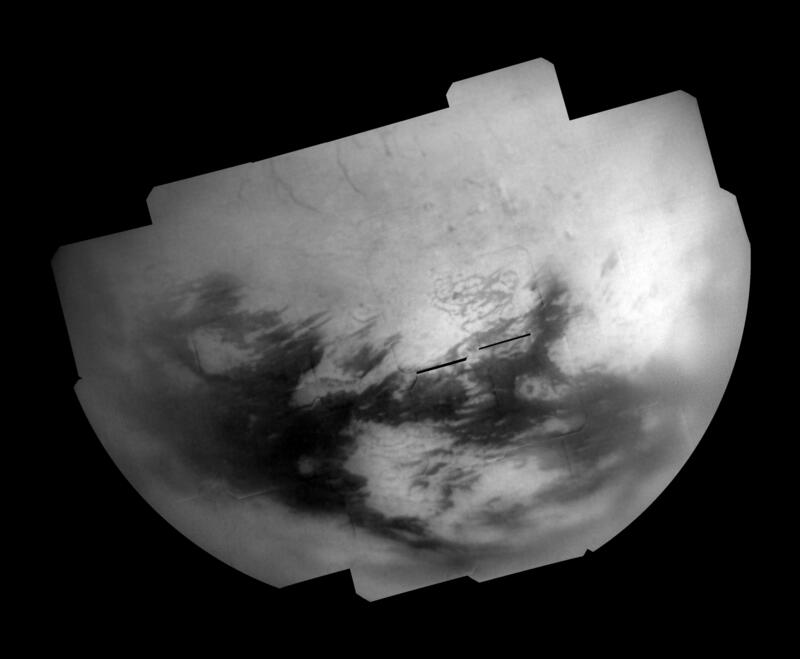 The region shown in this image, centered on the northern part of Titan's trailing hemisphere (near 31.2 degrees North, 220.7 degrees West), had only been seen at very low resolution until February 2007, when Cassini flew over this area for the first time. This mosaic consists of images taken during one of a series of flybys in early 2007 designed to study this long unavailable part of Titan (5,150 kilometers, or 3,200 miles across). Several intriguing surface features can be seen in this mosaic that warrant further study. Along the top of the mosaic is a series of dark lineaments, or linear features, that stand out against the blandness of the northern, mid-latitude terrain. These features were also observed by the RADAR instrument in December 2006 and represent an area of potential future co-analysis for the RADAR and camera teams. Another such region is the large bright area known as Adiri at bottom center, also imaged by RADAR in October 2005. The mosaic shows a number of dark areas within Adiri that line up with small dune fields observed by RADAR. A portion of the dark terrain surrounding Adiri was also observed in 2005 by RADAR, and likewise was found to consist of large stretches of longitudinal dune fields -- further supporting the correlation between equatorial dark regions and dune "seas." To the east of Adiri is a dark spot surrounded by a ring of bright material, which may be associated with an impact crater similar to Sinlap, discovered earlier in the Cassini mission (see PIA6222 ). This mosaic consists of 29 separate frames using a total of 116 images. Each frame consists of three images, taken using a filter sensitive to near-infrared light centered at 938 nanometers, allowing for observations of Titan's surface and lower atmosphere, added together. An image taken using a filter sensitive to visible light centered at 619 nanometers was then subtracted from the product, effectively removing the lower atmosphere contribution to the brightness values in the image, increasing image contrast and improving the visibility of surface features.This process is also intended to reduce noise, but some camera artifacts still remain, such as a dark ring caused by dust in the camera system near the bottom right of each frame. For a wide angle view taken during this Titan encounter, see PIA8943 . The images used for this mosaic were taken on April 11, 2007 from distances ranging from 106,000 to 180,000 kilometers (66,000 to 112,000 miles). This mosaic is in an orthographic projection with a pixel scale of 1.5 kilometers (0.9 miles) per pixel, although the size of resolvable features is likely several times larger, due to atmospheric scattering. An orthographic view is most like the view seen by a distant observer looking through a telescope.